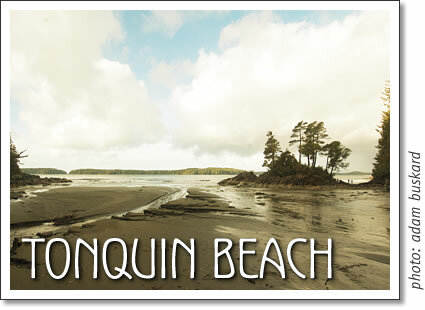 ﻿Tonquin Beach is unique in that it is located within easy walking distance of the downtown core of Tofino. To access the beach, follow First Street till it ends, turn right on Arnet Road and then follow Tonquin Beach Road as it veers to the left. At the end of Tonquin Beach Rd. you will find a parking lot and the beginning of the rainforest trail to the beach. The trail is a combination of board walk and path that winds through gorgeous rainforest and through a ravine, over a creek to the beach. The beach itself is fairly small being only a quarter of a kilometer long and is bordered at either end by steep rock faces. With its westerly exposure Tonquin Beach is a popular spot in summer for afternoon sunbathing and for watching the sunset. It is a great place for a picnic with the family or a game of boccia. Its location at the end of the peninsula makes it a great place for beach casting for salmon. Many a coho has been caught and cooked over the fire right there on the spot. Otters and minks are a common sight scurrying up and down the beach and even the occasional Orca or Grey Whale can be seen cruising by. Tonquin beach isn’t a surf location for the most part but the occasional braze soul can be seen during massive winter swells trying to surf its vicious shore pound. This is not suggested as it is quite dangerous. This beach gets its name from the early 18th century fur trading ship the Tonquin. The ship was built in New York in 1807 and was sailed around the tip of South America. It reached its destination of the mouth of the Columbia River with the purpose of setting up a fur trading post. This was the beginning of present day Astoria. After unloading its cargo the Tonquin set sail under the control of its captain Jonathan Thorn for Clayoquot Sound. Upon its arrival they began trading with the Nuh-Chah-Nulth for pelts. During these interactions Capt Thorn made a grave error by insulting a Tla-o-qui-aht chief, Nuukmiis by throwing some otter pelts at his head. The chief and a large number of warriors returned to the ship under the guise of continued trading and proceeded to attack the crew. Many were killed in the initial battle before a small number of the crew managed to repel the attack. These survivors tried to escape in a canoe but were killed on a beach nearby. One wounded sailor remained onboard and booby trapped the ship’s load of gunpowder. When a large number of natives returned to the ship to plunder its cargo the sailor lit the fuse and exploded the Tonquin with all onboard. Many were killed and the Tonquin was blown apart and set ablaze. Tofino beaches: Tonquin Beach in Tofino, British Columbia on Vancouver Island, Canada.